Do they want to attend an elite university/Ivy League school…or a state university, or a community college? Don’t get me wrong. State universities and community colleges rock, but elite institutions offer many benefits you just can’t get at state universities or community colleges. If your student has a choice between attending a state university or an elite university, they should definitely go with the latter option! Why? Stick around, because I’m going to tell you about all the benefits of an elite university! You probably already guessed this one—courses taken at elite universities and Ivy League schools are much more rigorous than comparable courses taken at state universities or community colleges. You might be thinking, “I don’t want my child to get overwhelmed, maybe they should just stay in-state…” but if you really think about it, what is the point of your child having an education if they’re just going to breeze by in all of their classes? College is all about pursuing higher learning, and oftentimes the best way to learn a subject is by challenging yourself. So in that case, why not encourage your child to take on a challenge? It can only help them later on in life! Most schools offer a variety of resources to their students, including libraries and study space, but the resources offered by elite universities and Ivy League schools are especially amazing! Elite institutions are home to a variety of historic documents and artifacts, as well as state-of-the-art labs and research facilities. Not only do elite universities offer these resources to their own students, but they also offer them to students of other elite universities as well! Need access to an unfinished, unpublished Shakespeare manuscript? At an elite university, you can get it by the following week! If your student attends an elite university they too will be a part of this academic community and have access to all of these amazing resources as well. 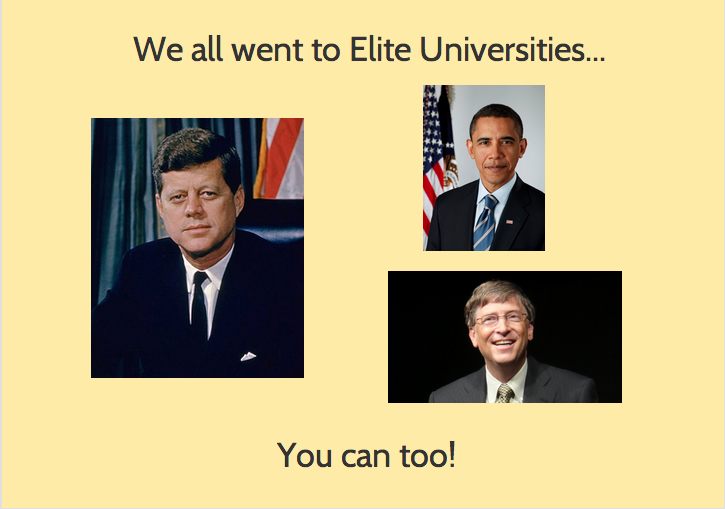 Nearly all of the world’s most prominent leaders attended elite universities or Ivy League institutions. Oftentimes, these notable alumni return to their schools and make speeches, hold master classes, and sometimes they just come to hang out. If your student attends an elite university, they will have the opportunity to meet and learn from these amazing alumni. And, who knows–maybe someday, your child will get to be one of these awesome alumni! You may be familiar with that old phrase, “you are the average of the 5 people you spend the most time with.” So why not surround your child with brilliant people? It goes without saying that the professors at elite universities are brilliant (most professors are), but elite universities are unique in that every student is brilliant as well. What makes these students so special? Well, they really are the cream of the crop. These schools are incredibly tough to get into, and often having good grades is not enough. Each of these students proved to admissions that they are spectacular. These are the students who strive to make change, and go out of their way to make the world a better place. Sound like the kind of people you want your kid hangin’ around? I thought so. Get the leg up when applying to grad schools! Is your child interested in grad school? Medical? Law? If you answered yes, then your child should consider attending an elite university! Why would attending an elite university give your child the leg-up when applying to grad schools? Well, while grad schools are interested in GPA, they also look at the overall difficulty of your child’s course load and, as I described earlier, the courses at elite universities tend to be more rigorous! If your child attends an elite university, they will have a better chance of getting into medical school than someone from a state university or community college with the same GPA. Not only that, but students at elite universities tend to have no trouble finding valuable extra curricular activities or employment opportunities, which can really help boost their résumé! Your child can shadow a doctor if they wish, or land an awesome marketing internship with a top-notch company. Elite institutions also offer tons of undergraduate research opportunities! If the previous 5 benefits weren’t convincing enough for you, I know this one will be, because the fact is money talks. Yup, it’s true! People who graduate from top-tier schools typically have higher incomes than those who graduate from state universities and community colleges. As you can see, the average Harvard graduate has a higher starting salary than that of the average ASU graduate, and the average Harvard graduate has a significantly higher mid-career salary! Is it something in the water? No, probably not! One of the main qualms parents have with sending their kids off to elite universities and Ivy League schools is that they are so expensive! But if you think about it in terms of the return you’ll be making on your investment, you’ll realize that it is well worth it—a good education really is priceless. What are you and your student waiting for? Tell your student to start writing those CommonApp essays, and get their applications in ASAP! The list of benefits doesn’t end there either. What other great benefits do Ivy League Schools and elite universities offer? Let us know in the comments below! Yeah, so…you can’t get access to “an unfinished, unpublished Shakespeare manuscript,” because those have all been lost to history. You could get access to a rare quarto, though. The closest to a Shakespeare manuscript you can get is Sir Thomas More, but that’s owned by the British Library.